James M. Gold is Professor of Psychiatry at the University of Maryland School of Medicine with his laboratory based at the Maryland Psychiatric Research Center. Dr. Gold completed graduate school at Adelphi University and then did a post-doctoral fellowship in neuropsychology at the Westchester Division of New York Hospital. After spending 6 years at the Clinical Brain Disorders Branch at NIMH Intramural Research program, Dr. Gold established his independent lab at MPRC. Dr. Gold is on the editorial board of Journal of Abnormal Psychology, Schizophrenia Bulletin, and Cognitive Neuropsychiatry. 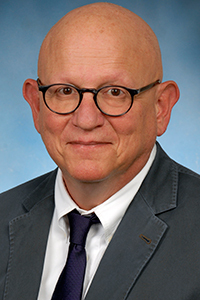 Dr. Gold is the President-Elect for the Society for Research in Psychopathology and the recipient of the Alexander Gralnick Investigator Award from the American Psychological Foundation. Dr. Gold’s NIMH supported research aims to better understand the cognitive and motivational deficits that are responsible for the poor functional outcome experienced by many people with severe mental illness.